From singer Brian McKnight to actress Gabrielle Union to rapper Master P, singers, actors and rappers have often bragged about their athletic accomplishments. #ShowMeTheReceipts, a bimonthly feature at The Undefeated, will authenticate those declarations. In this month’s installment, we verified rapper Queen Latifah’s receipts. Nine years after winning her first state title with Irvington High School, Dana Owens asked everyone to clear out space on the floor so she might ask Seattle SuperSonic Shawn Kemp if he would have this dance with her. She waved everyone off. She was feeling confident she could handle the NBA All-Star forward all by her lonesome and didn’t need any backup for this one. He wiped his hands along his shorts and down his jersey before dribbling the ball between his legs a few times. As Kemp started to make his move toward the basket, Owens pickpocketed the SuperSonic. She took several dribbles toward her basket as the 6-foot-10 forward pursued her. Owens took off from mid-paint and sent up a layup that rattled against the backboard and around the rim before sinking to the bottom of the net. Triumphant and defiant, Owens lifted her arms in victory, and the crowd, announcers and her teammates erupted into cheers. “I don’t fear nobody out here! Nobody,” Owens said into the camera. These days, Queen Latifah is gracing the cover of Essence magazine and starring in the new movie Girls Trip, which hit theaters on July 21. She earned an Emmy nomination for her lead actress role in HBO’s Bessie in 2015. All of that, along with her career as a rapper and TV host, comes after the time when she was running wild on the hardcourts and blacktops in New Jersey. When Smith met Owens as a sophomore transfer in 1985, he already knew she was going to be a key member of his soon-to-be championship team. After spending her freshman year at a Catholic school, Owens moved on to Irvington, where she was immediately added to a stacked varsity team. Smith, who coached Irvington’s girls’ basketball team for four years and led it to back-to-back state championships in 1985 and 1986, recalled one game in which Owens’ personality as an entertainer shined through. The team was playing a game on TV, and the coach called a timeout. The starters took a seat on a bench, and people who weren’t in the game made a semicircle behind Smith. As he was coaching up the starters, Owens heard the song the band was playing in the gym, so she started dancing behind the coach. She turned around looking at the band and began to dance and sing along with the band, paying the coach’s instruction no mind at all. But while Smith was in the midst of coaching, he wasn’t aware any of this was happening because he had his back to her. It wasn’t until Smith got home that night and saw the game on TV that he realized what was taking place. But that kind of energy often came in handy for the team. If the players were having a hard practice and got stressed out, then Smith would give the team a break, have the girls form a circle and ask Owens to hop in the middle and drop a beat. While Owens’ reputation as a jokester preceded her, on the court she was no one to mess around with. Smith often inserted Owens into the rotation as a sophomore to defend the better players on the other team. “What she did for us all the time was the opposite of what you would think her personality was,” said the retired educator. “She was my enforcer. “That was her key part of the game. I mean [it] would be unfortunate if I had an opponent that was like maybe getting too many rebounds. I’d call Dana over off the bench, and say, ‘Dana, 23 is getting too many’ … 23 didn’t get any more rebounds after that. The only problem was Owens was playing behind an upperclassman — the No. 1 recruit in the nation, Tammy Hammond — who would go on to star for USC the season after Cheryl Miller graduated. Hammond finished her career the semester before Lisa Leslie joined the Trojans. Owens described Hammond as her best friend in her biography Queen Latifah. Smith said Owens helped out in every way she could. She hustled all the time and always did her best to help with team morale. She worked hard, and when she played, she played a lot and she played well. 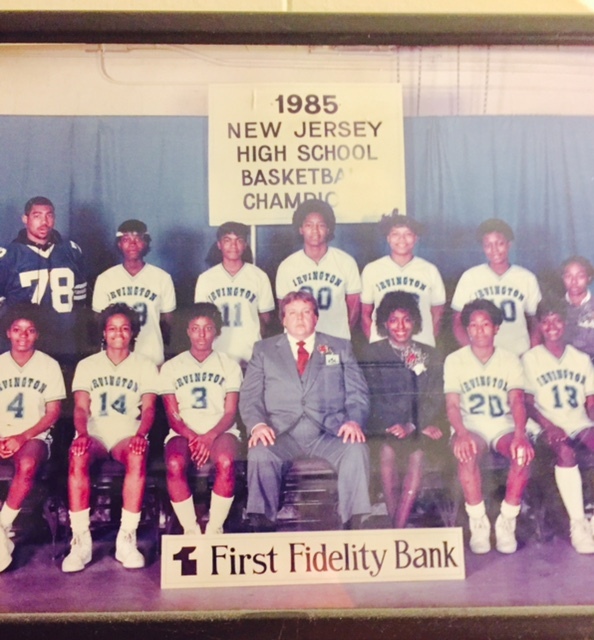 Queen Latifah, formerly known as Dana Owens (third from top right) with her 1985 championship team. Where Owens needed to improve was in handling the ball, which she wasn’t expected to do a lot of as a forward. Smith recalled Owens’ junior year, in which the team was playing East Orange in the county championship. The coach put Dana in — Hammond got into foul trouble — during a full-court press, and she came up with three steals in a row. It turned the tide for Irvington, which ran away with the game after that. Of the two championships Irvington won, Smith explained that the first one was the more challenging title because the team had to overcome heartbreak before the beginning of the state tournament. In the last three seconds of the county championship, Irvington lost the game because of a controversial call, Smith said. But he wouldn’t give the girls a break to feel sorry for themselves, as the team still qualified for the state playoffs. The players were put through rigorous practices to keep them focused on the task at hand and not looking back at what had happened. “What we did then is that I said, ‘Today is a new day. Today is a new tournament. The state tournament. We start all over. We have six games to win the state champs. Let’s work on that. Now, we may not be good candidates because we lost with three seconds, but we can be the state champ and be better than a team that beat us because we know we are so good together,’ ” he recalled of the pep talk he gave the team as they started practice for their first state championship. Irvington’s second championship season ended with a 71-61 win over Hightstown in the New Jersey state final. Our conclusion? She’s legit. Queen Latifah’s receipts get a passing grade from us.